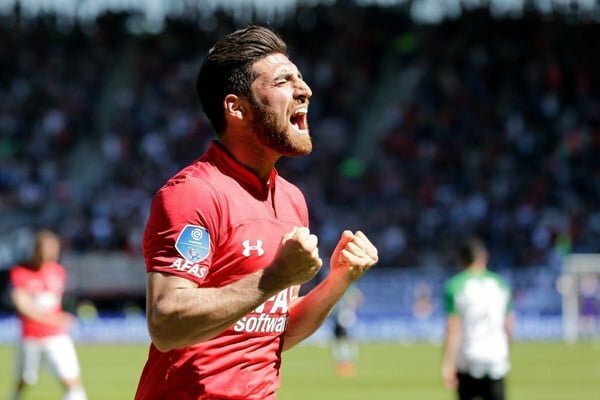 Iranian international winger Alireza Jahanbakhsh has been named the top goal scorer of the premier Dutch football league Eredivisie. With his hat-trick in the last fixture of the season, Jahanbakhsh managed to raise the number of his goals to 21. He has also made 12 assists this season. This means that the Iranian winger will be the first Asian top scorer of a major European football league, a Farsi report by Varzesh3 website said. Meanwhile he is likely to be picked up as the best player of the Dutch football league as well. The 25-year-old, who has been starring for AZ Alkmaar football club in the Dutch league, is on the radar of several Premiere League and Serie A clubs. Az Alkmaar considers selling him for at least £9 million, according to Daily Mail. Watford, Bournemouth, and Burnley are among the clubs closely following Jahanbakhsh. He can play across the front line and was first touted to make a major breakthrough by former Manchester United assistant manager Carlos Queiroz who called him into Iran’s 2014 World Cup squad. Chelsea, Manchester United, Celtic, Ajax and PSV Eindhoven followed him when he initially moved to Holland with NEC where he won their player of the year but he opted instead to move to AZ in 2015. Technically good on both feet and with an eye for a pass, Jahanbakhsh has continued to attract major European scouts.